Don’t just take our word for it! 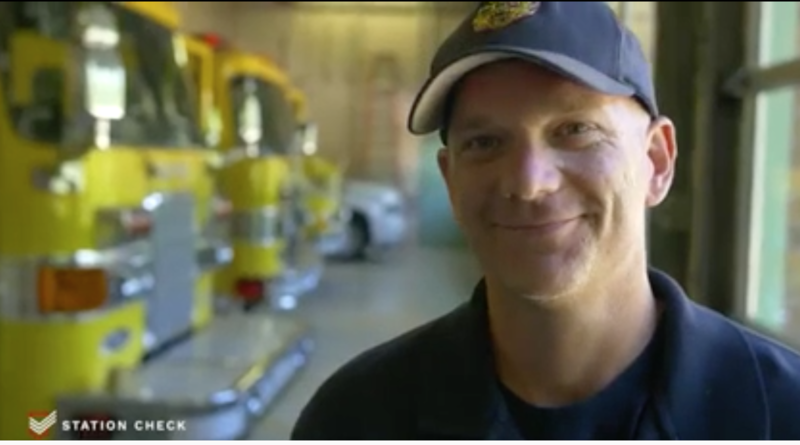 One of our customers, Valley View Fire Department, explains how Station Check ensures that nothing falls between the cracks. The captain was perplexed. The field reported a runaway tire coming off trailer #17. That trailer was used to haul around rescue boats to various emergency scenes in the rivers and lakes that crisscrossed the region. While responding to a potential drowning, the tire had simply flown off its mount crashing right through the plate glass window of a local diner. Fortunately, no one was hurt, but the tire missed hitting old John Henry by less than a foot. The town loved that old man. Aside from the human tragedy, it would have been an ugly lawsuit besides. Funny thing is – that was the sixth runaway tire coming off a trailer in the last twenty months. When the captain went back to ask the team about what could be wrong, they came back with, “Must be a manufacturer’s flaw. We take good care of our trailers.” One guy even suggested the trailers may be haunted with a polite laugh. The captain kept thinking. The technology behind making a trailer is pretty well known. It’s not very likely that this experienced manufacturer would start producing lemons, just for our group. The captain went back and pulled up the check records for the trailers. The process was tedious. He had to pull out individual paper forms for three years. Of course, they would have to be filled out again afterwards, but if could save someone like our beloved John Henry, well…it was worth it…. The tattered forms were all stacked up on the lunchroom table. It included weekly check for three years for the unit’s 11 trailers, or about 1,716 sheets of paper. The captain poured himself a fresh cup of joe and started digging through them. His team was right: they had inspected the trailers every week thoroughly for the last 156 straight weeks. There had been a few maintenance events and they were well documented. Something clicked in the captain’s head. If we have lug-nuts that aren’t loose being tightened every week by linebacker-sized checkers, could something go wrong? The captain asked to see the bolts from the most recent runaway tire, and sure enough the threads had been stripped and several bolts had snapped. Relieved he had an answer, the captain adjusted the check instructions to say, “First loosen the lug-nuts. Then re-tighten them.” He then refiled all 1,716 of the check records. The next morning around 7:00 am, the captain bought John Harry a cup of coffee at the diner and shared this story with him. John Harry shook the captain’s hand and thanked him. When they were leaving, he gave the captain a big, old, firm granddaddy hug. We’re a rural fire department. We’ve all had our share of calls for rescuing a cat stuck in the tree, but our station seems to have taken it to the next level. Maybe everyone has seen these things, but in the last few years, we’ve also been called to save a dog whose head got stuck in a hole in a big old oak. We got called to save a very large woman who got stuck in mud pool in her back yard. We also pulled a few parachuters out of trees … and we even got called to pull out someone stuck on their toilet. Boy oh boy, there are a lot of folks getting’ stuck out there these days! Apparently, our boy went pale as a sheet, but by all accounts, he stayed by the woman’s side, administering O2 through the whole birth. I’m happy to say, mom and baby were both ok, and your boy learned a little something about how the world works. A few weeks ago, we got dispatched to an apartment building on the report a candle was burning through the floor of an upstairs neighbor. You never know quite what to expect. We got to the scene and entered the upstairs apartment. Come to find out the person inside was practicing autoerotica when he fell over and knocked the candle over. Luckily for him his neighbor heard him yelling for help. The person was wearing only leather chaps and leather mask, bound to a chair. Not sure how he got himself in there, but we got him loose and put out the fire before it did too much damage. I was running as an EMT basic on a weekend shift. It was about 2:00 pm when the tones for Fire & EMS were dropped, with the dispatcher reporting a “pedestrian/ motor vehicle – reported 3-year-old girl hit by truck with injuries.” My heart always skips a beat whenever the tones drop, but when a child is involved it’s much worse. I started playing out all the horror I was going to see and began to steel myself. When I arrived on the scene, I saw an older lady and a young girl sitting on the lawn under a tree. As I ran up to them the little girl was crying, and the older lady had a paper towel pressed to her forehead. Asking what had happened, the older lady said, “Her older brother threw a truck and hit her in the head. She is bleeding.” Turns out it was a little matchbox truck that the 3-year-old was hit with. While it is funny to think back to, I mainly remember that incident as the time I was most relieved I have ever been in my life. For all the life of me, I can’t see a firefighter going to Hell, at least not for very long. They would end up putting out all those hellfires, and the angry devils would run them out. Many times when fire departments automate their paper checklists, they find some of the procedures they have been following haven’t been questioned in years. A case in point comes from a certain Northern Ohio firehouse. They had a rule stating that every evening, all the vehicles in the station had to be driven out onto the driveway so they could thoroughly wash down the tires. The crew performed this tedious task dutifully every night. Then one day, a few years ago, a new guy started with the department. As new guys often do, he questioned the procedure, asking the lieutenant why they were washing down the tires every night? The lieutenant replied that it’s been in the book for as long as he could remember. He then told the new firefighter if he’d like to find out in his spare time why it’s on the list, it was okay by him. So the new guy went down to the town library which kept historical documents on everything that happened in the city. It turned out the wheel washing rule dated back to the early 1900’s when most people still got around on horses and buggies. The horses left plenty of dung on the road, and the firehouse vehicles often picked it up on their tires. Nobody wanted the firehouse to smell of horse-poop, so they made a regulation that every night the wheels of all the vehicles had to be cleaned off. It’s been more than a few decades since horse manure has been a problem in that town. So when the new firefighter shared his research with the lieutenant and chief, they rescinded the nightly tire cleaning rule. Sometimes, it takes a new set of eyes to ask the questions that need to be asked! Carl was just over a year into his job as a chief of a seven-station department located in a southeastern state of the US. His department was a fire and rescue unit that fought about 50 significant fires each year and responded to over 2,000 EMS incidents. The department had experienced 11 civilian fatalities in that year and 3 fire fighter injuries, but by NFPA stats this was below average, and Carl was proud of the performance of his crew. So when the ISO (Insurance Services Office) inspector showed up at Carl’s station one morning in June, he wasn’t overly concerned. Before he had become chief, Carl had seen the ISO guys come in from time to time. You never knew exactly what they would be asking for during an inspection. The manual says ISO checks three main areas: emergency communications, fire department operations and community risk reduction. This is formally referred to as a Fire Suppression Rating Schedule (FSRS), and there is a maximum score of 50. The FSRS seeks to ensure every department regularly tests it equipment and maintains inventory on each of its vehicle to be in accordance of the well-known NFPA 1901 standards. ISO officers also want to know about training — how often it is conducted and who participates. They want to be sure the apparatuses and equipment are being inspected frequently, and that repairs are promptly completed. Of course, they want to know how quickly and efficiently the department responds to emergencies. Carl was confident that his department was well within compliance. His teams covered every section of FSRS, including daily inventory checks on each apparatus and regular pump tests. The ISO officer asked to see the records for two checklists on a single vehicle for two separate days. Whether the inspector found a needle in the haystack, or maybe the request proved out a hunch the inspector had developed after years of experience, it turned out that the firefighter completing the inspection had not put in pump test results in either checklist on both days requested. The fallout was that the ISO inspector dinged Carl’s department risk rating, which had been class 1. This increased their insurance rates, which did not go unnoticed. It gave Carl a black mark on this record which was reported to the county and city council. How could Carl have known about this oversight? He could have gone through the manual records every night at his kitchen table to be sure they were perfect … or he use checklist software with at-a-glance dashboard features to ensure that oversights like this are reported across the entire department and don’t fall between the cracks.